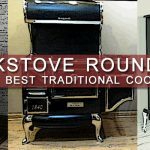 But what about those in less rural locations, who don’t desire the lifestyle that often warrants a cookstove but are still interested in the unique qualities of cooking with a wood-fired oven? 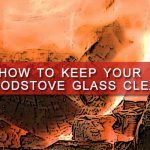 Is there a way to obtain the crisp, succulent quality of a meal cooked over the fire without a fireplace grill? As it turns out, yes! Today, many homes in North America have some kind of backyard entertainment area, be it a patio, a gazebo, a simple pergola-covered patch of stone or brickwork, or something similar. It’s a place for families and friends to converge, socialize, and often most importantly, share food. That’s where the pizza oven comes in, a massively popular centerpiece for any outdoor area that’s as easy to buy today as a new lawnmower. Long before the words “pizza oven” became the common term for these cookers, they were usually referred to as a “masonry oven”, a cooking unit built with masonry bricks that became extremely common in Italy. While we might think of them as Italian-style today, the basic mechanics of the pizza oven have been employed throughout Europe for centuries, dating back to at least the Roman Republic. 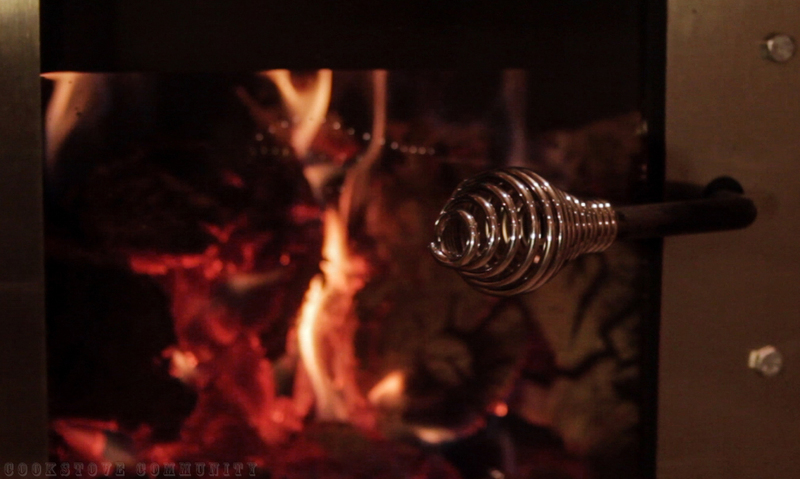 Here, the oven traps and radiates heat for an even cook, and with a front-loading design, that heat can be stored for lengthy periods of time without the need for an active fire. 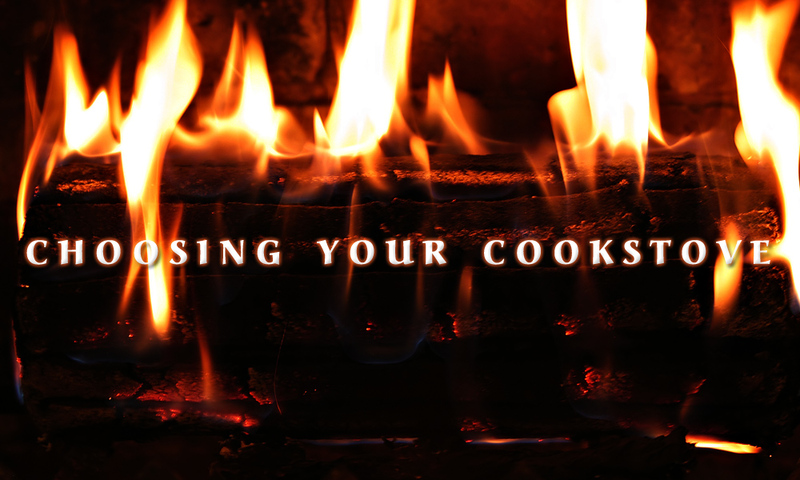 It’s one of the most tried and true methods of cooking, and there’s a reason so many restaurants and professional cooks still rely on it. However, the pizza oven has evolved since the time of Caesar. 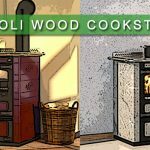 In Italy, for example; although both regions of Italy use the basic tenets of the traditional oven design style (referred to as the “Pompeii”), there are a few differences in their execution. Northern Italian ovens from Tuscany, Emilia-Romagna, etc., tend to have a taller dome than their Southern counterparts. 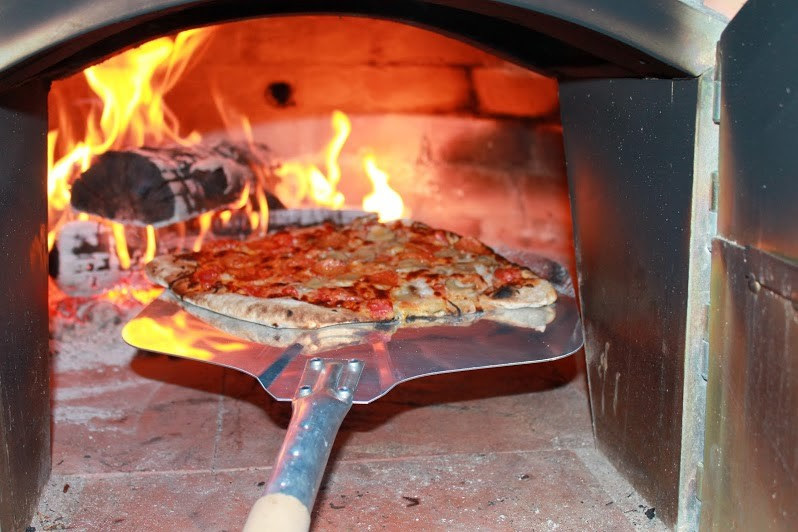 This allows the oven to bake a more varied range of pizza styles, from New York-style to crisp, artisan-style, and hold temperatures that range from 500ºF to 1000ºF (the Pavesi wood and gas-fired pizza oven and the Pavesi rotating pizza oven are great examples of this). The Southern (Neapolitan) approach, by contrast, has an oven with a low dome and is built to work with very high heat, between 800ºF to 1000ºF. This heat creates a stronger top heat that bakes the Neapolitan-style pizza typical of Naples (the Acunto Neapolitan Pizza Oven, for example). 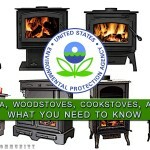 In the late 1940’s in the United States, many Americans sought to build their own brick ovens as they had seen them overseas, but found them commercially unavailable in their own country. 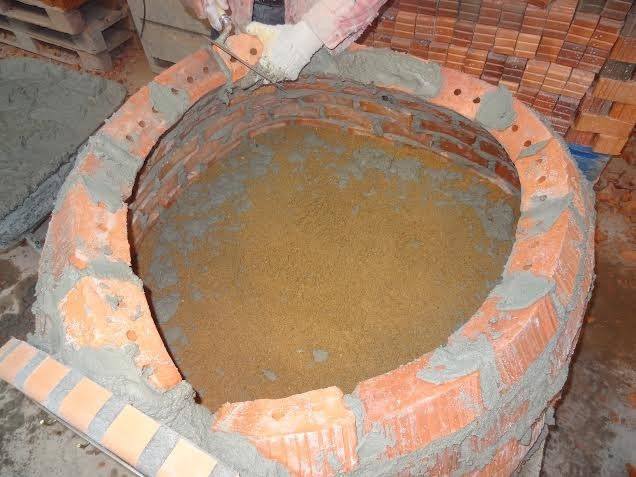 Brick ovens require the expertise of a qualified mason to properly construct, however, as arches can be very tricky and domes even more so. 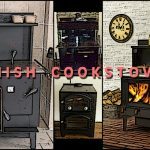 That difficulty didn’t put a damper on the desire that many had for these ovens though, and as new masonry products and construction techniques grew in the 20th century, so did the ability for masonry ovens to be pre-cast and assembled on-site, or outright fully assembled and shipped to the customer. Which brings us to today, a time when pizza ovens are widely available at remarkably cheap prices. Beware though: Those prices are not simply a sign of the times, but rather an indication of a saturated market which often means a general decrease in quality. Somewhere along the line we lost the essence of what made this oven special, with “pizza oven” morphing into a term that means “any outdoor oven that burns wood.” We even have electric pizza ovens that can sit on a kitchen counter, purportedly doing the same thing. The reality is that there are a lot of variables when you get up close and personal with many pizza ovens. For example, check out the Fontana Pizza E Cucina Double. Ovens like this do not have much masonry in them, and therefore little thermo mass, which means they don’t bake the same way as other ovens. 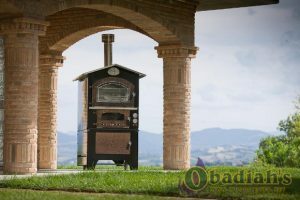 In fact, this is a hybrid wood fired pizza oven cookstove, but Obadiah’s classifies it as a wood-fired cook stove. Why? 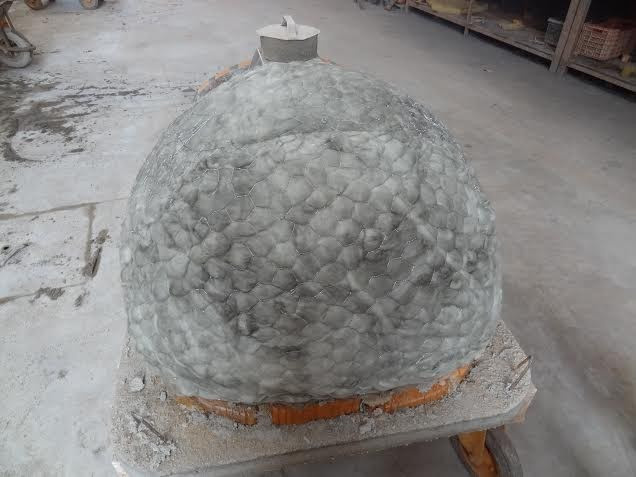 The dome is stainless steel and the bottom is masonry, much like many other pizza ovens today. 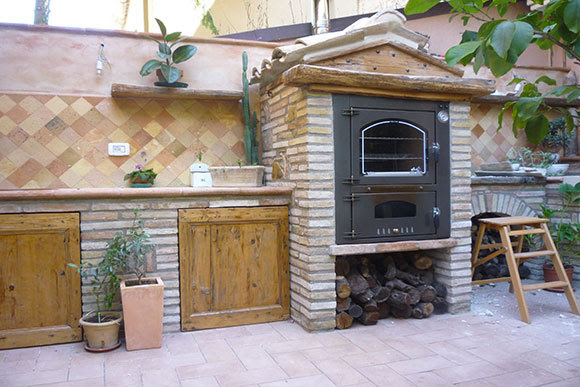 Other variations on the idea of a pizza oven have appeared too, like free standing wood-fired ovens that are outdoor rated, meaning they cannot be installed indoors save for a few exceptions (it must be connected to a Class A chimney to be safe and legal indoors, as shown below). 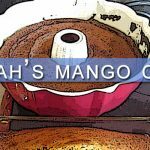 From these variations and others Obadiah’s has spent years whittling down the list of top-quality pizza oven providers to a select, reliable few. 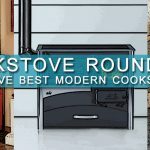 Manufacturers like Peter de Jong’s “Fired Up Kitchens” have installed more pizza ovens in more commercial locations than just about anyone, including the likes of top-rated restaurants and venues in downtown Chicago, Brooklyn, New Orleans, and even the Caribbean. That’s why we’ve been partners with Jong’s American arm, Forza Forni, for years, as well as designing and supplying chimney systems for them. They’re a quality line, and we’re proud to support them. Most folks can’t just ship a pizza oven over from Italy, however, and that’s where importers like Grills’n Ovens come in. 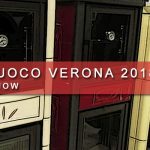 They have been helping us get the beautiful La Nordica line of cookstoves to our North American customers for years, but they primarily deal in ovens, such as the Portuguese Brick Pizza Oven. 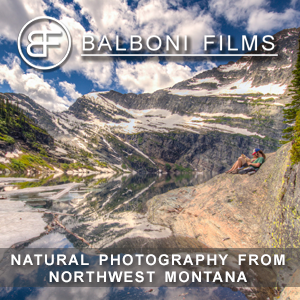 Check out the construction below! 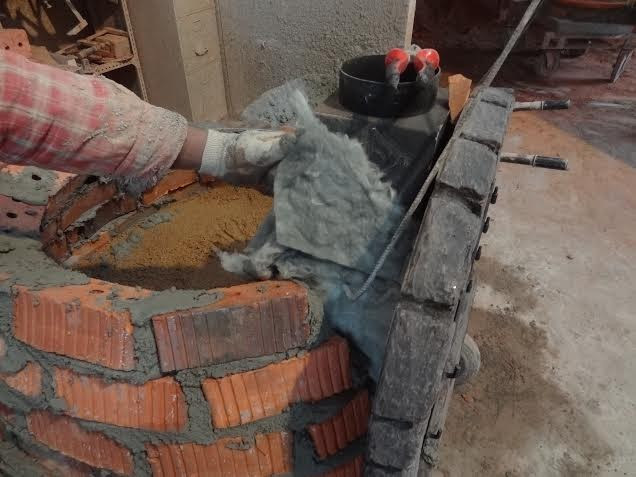 This baking oven is made with actual brick, in Portugal, as part of a long local tradition. 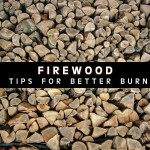 A typical Portuguese wood-fired pizza oven will experience discoloration on the front after awhile due to smoke, but this is actually seen as a point of pride as it indicates a frequently used stove. Obadiah’s is a huge fan of this model because at $1500 after shipping (to anywhere in North America! 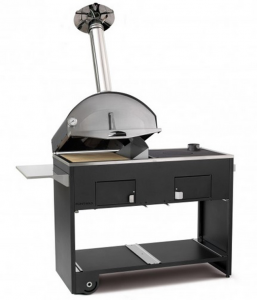 ), this is the best buy for a real hand-made brick pizza oven. The Italians don’t have a monopoly on pizza ovens, though. 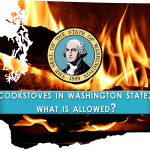 Founded in Lithuania and now based in Ohio, Sopka Inc. is well known for their outstanding cookstoves (which we’ve covered here), but that’s not all they can do. 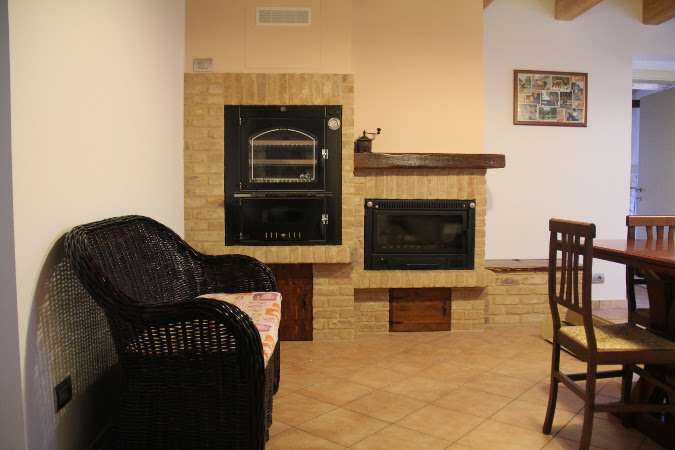 Sopka has been producing pizza ovens for the last several years, with great results. These ovens mix elegant exteriors with durable, highly functional interiors and come in a wide range of designs, from the highly versatile outdoor Cupola to the regal Giove with its massive oven. Sopka definitely brings the craftsmanship of their cookstoves to the world of pizza ovens, and Obadiah’s certainly recommends them. 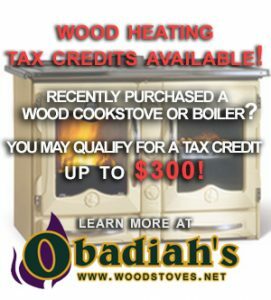 If you’re looking for the best in wood cooking, Obadiah’s Woodstoves is the leader and has partnered with more top names than any other hearth heating company anywhere. Call us, and we will put you in touch with the proper experts, or recommend the best solutions and products for residential, or commercial installations. Obadiah’s is here to help you find the pizza oven you deserve, for the price you can afford.